Phantoms celebrate a goal against MK Lightning. Photo: Tom Scott - AMOimages.com. A late night led to a long night for Peterborough Phantoms. The city team were beaten 5-2 by unbeaten pacesetters Milton Keynes in an English Premier League derby date last night (September 25)..
Petr Stepanek on the puck for Phantoms against MK Lightning. Photo: Tom Scott - AMOimages. The damage was done in the opening period at Planet Ice as Lightning turned their early dominance into a match-winning advantage with a three-goal scoring spree while Phantoms looked lightweight and lethargic. Even their usually dependable netminder, Janis Auzins, was beaten by a couple of shots he would normally be expected to keep out. 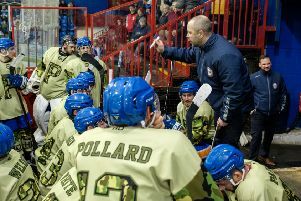 Coach Slava Koulikov put the sluggish start down to a mammoth journey back from a Saturday-night success in Basingstoke and was determined to take the positives from a much-improved remaining 40 minutes. He said: “We had a nightmare trip back from Basingstoke on Saturday night. “There were a lot of roadworks on the motoways and we ended up having to go through central London. “We didn’t make it back to Peterborough until past 3am on Sunday morning and then some of the guys had to travel on further. Milton Keynes were in control from the moment Mikolaj Lopuski flummoxed Auzins with an early blast from distance last night. Ex-Phantoms man Craig Scott soon put a second goal on a plate for Frantisek Bakrlik following a breakaway just as a Phantoms powerplay ended. And when Bakrlik lashed in a third goal during a numerical advantage for the visitors with little more than 11 minutes on the clock, the writing was well and truly on the wall for Phantoms. But the city men were much improved in the second session and cut their arrears when Ales Padelek lashed a shot past Lightning netminder Przemyslaw Odrobny, who made fine saves to prevent Darius Pliskauskas and Connor Glossop making further inroads later in that period. Phantoms continued to ask plenty of questions of their table-topping visitors in the final period, but they were undone by a fourth Milton Keynes goal when Milan Baranyk tipped in a Lopuski shot. Phantoms did reply when Marc Levers got a touch to a James Ferrara effort during a powerplay and the impressive Petr Stepanek was only denied a fine individual strike by Odrobny. But it was MK who struck again when Bakrlik completed his hat-trick with an empty net goal which referee Matt Thompson allowed to stand in the final second even though it appeared to cross the line after the buzzer had sounded. Koulikov added: “My guys could have given up at 3-0 down, but they kept battling and caused an unbeaten MK team plenty of problems. “We have played two top sides in two successive weekends and come away with a four-point return which is no mean feat. “We knew we had a very difficult start to the season so to reach the end of September with a 50 per cent win rate is pleasing. Phantoms sit fourth in the early-season standings and face two of the teams above them next weekend. They travel to surprise packages Hull this Saturday (5.30pm) before hosting 2014/15 champions Telford the following night (5.30pm).